No one is perfect, and eventually your organizing system will fall apart. How you respond when this happens, however, will determine how much anxiety, stress, and clutter paralysis you will feel. Failure only happens if you never recover. If your system falls to pieces but you eventually get things back in order, you simply learned a lesson. You only fail when you give up entirely and abandon all uncluttering and organizing efforts for the rest of your life. You’re not failing; you’re learning. Being organized takes practice. You wouldn’t play a musical instrument or a sport like a professional if you hadn’t put in hundreds of thousands of hours practicing, so don’t expect professional organizing results without years of practice. Who cares?! Unless your health or welfare are at risk, being disorganized is not the worst thing in the world. Watch 30 minutes of the national news to help put things in perspective. Embrace the mess. Since you will eventually get off your bum and get back to an organized existence, take a day (or seven) and enjoy the chaos. At least temporarily, let go of the stress. Determine why you want to be organized. 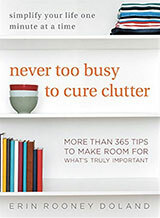 As I’ve written in the past, if you don’t know why you want to be organized and clutter free, you’re going to struggle with every attempt you make to be an unclutterer. Ask for help. Call a friend and ask him/her to help you get your project started again. If you don’t want your friends to see your place a mess, call in a professional organizer. Plan a party. Nothing gets me moving faster than knowing there will be people coming into my house. Plus, the reward is that when your space is orderly, you get to celebrate with a party! Acknowledge that you’re procrastinating. I don’t know why this works, but simply admitting to yourself that you’re avoiding a task can help get you motivated to change. Check out “Eight strategies to stop procrastinating” for tips on what to do next. Plan your project. 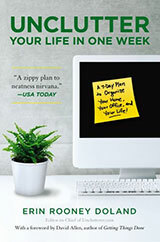 As you would a project at work, plan your entire uncluttering and organizing project to help you get back on track. Pull out your calendar, determine the scope of your project, create action items, and block off time each day to reach your goal. Being specific (and realistic) about what you will want to accomplish helps to alleviate the overwhelming Cloud of Doom and realize you can get things back to normal. No excuses. Follow your project plan and just do it. There isn’t an easy way. You will have to do the work. However, the end result is definitely worth it. Create household routines. In my home, we have “Doland Duties.” If you don’t have a chart of daily routines and responsibilities, now is the time to establish one or evaluate your old one. Use a meal plan. The easiest way to eat healthy and keep from stressing out about what is for dinner is to create a weekly meal plan. Declutter. The less you own, the less you have to clean, organize, store, and maintain. Enjoy the calm. Take some time to reflect on how different you feel when things are uncluttered and organized instead of chaotic and disorganized. Remembering this feeling, and enjoying the remarkable life you desire, are great motivators to keeping you on course in the future. This post couldn’t have come at a better time for me. I was looking at my bedroom this morning and thinking I have got to find a way to stay organized once I get organized. I have piles everywhere with magazines, papers, mail etc. Ugh! I’m going to print out this post and put it on my bulleting board so that I can refer to it often. p.s. I definitely agree with the meal plan idea. It’s worked wonders for my sanity and health! 3. Call me, have a rant, get it all out of your system. Sometimes people are just too hard on themselves. Like any sport, you reach a level then plateau for a bit. This is NORMAL. Once you’ve been on the plateau for awhile you’ll then be able to move forward once again. I know that I do a good organizational job at home but I could do better. Spring always brings out the stress in me to get rid of things. The pressure to Spring clean! I agree…this was a very timely posting! I am a clutter bug & its so bad I can’t even tell my husband where something because I know which pile it’s in & where in the pile it is! haha…thank you for the tips! And the meal plan is a great stress-free way to keep meals healthy & quick too! This is one of my favourite posts – ever. Thank you. Thanks for posting this! I fall off the wagon all the time, but I get through by assuring myself it is only temporary. As an artist and a person in this modern world, we are constantly having to fight clutter! This was great encouragement. This is a timely post for me, too! The “Throw a Party” suggestion doesn’t work for me, however, because I just tend to shove everything in trash bags and stuff them into closets! I guess that’s one form of organization, but not a very good one! I agree with the limited success of the “throw a party” approach. I do tend to get the *common/public* areas cleaned up by moving stuff into the bedrooms or closets. On the other hand – if I were to just go nuts and throw a whole house party with a different theme for every room or turn my house into a museum-esque space…well, that might work. “Acknowledge you’re procrastinating” – a good thing to status yourself on after you’ve committed to being a productive unclutterer. Very good content. Decluttering our physical environment serves so many purposes. It allows for clarity and fuels our creativity. It’s also important to declutter the environment of you, however, decluttering our physical environment will assist in also decluttering our mind. There are 9 environments that all must support what we do. Uncluttering/weight loss/smoking – it’s to easy to beat ourselves up when we fall off the wagon. Usually I can just take a deep breath, look at what I *did* accomplish, and start again. Maybe what I need to do for clutter (and weight loss) is to put my stubborn streak to good use, and decide that “piles of stuff (or piles of food) is *NOT* going to win!!!”. What worked when I finally quit smoking years ago, after falling of that wagon many times, was I told myself “no stinking rolled up piece of paper was going to win”. Like others, this couldn’t have come at a better time. Day before yesterday, we got home from a 4 week trip to Virginia, after leaving both our 18 and 20-year-olds alone… in the house… with 3 big dogs… MISTAKE! While there were no parties going on (I have Gladys Kravitz who lives across the street) it sure as heck looks like there was. I could not believe my eyes. I began tackling it today. In all fairness, I have never been an unclutterer, but after seeing what happens when you’re even less than that, I’ve decided it’s time to try and start. One thing though, if I start “planning” the project, I’ll end up doing spreadsheets, and looking up cool formulas to make it easier and on and on. I’ll end up doing anything BUT planning and much less, acting on the plan. What an awesome and uplifting post – thanks!! I would love to stay organized and uncluttered, but the rest of my family seems to think otherwise. How to motivate others?